It was one of those warm, wide days in early spring, when the world seems to be coming back to life all of a sudden. The first insects of the year careered about dozily, as if woken unexpectedly, and flurries of finches tumbled from one tree top to the next. A magpie strutted cockily across the narrow lane which curves around the graveyard of St Lawrence, and then took flight as we approached. I had been here before, a couple of years previously in high summer, but then we had arrived to find the church covered in scaffolding, and the gates barred off. Now, the tower bore crisp witness to that occasion, its fresh cement rather stark and gleaming in the low sunlight. At the entrance to the graveyard, a fat brown rat basked in a rut, and watched us warily as we walked towards him. Reluctantly, he pulled himself up and wriggled up under a yew tree, leaving the graves for us. And they are a good crop here, some fine, lichened examples from the 18th and early 19th centuries. St Lawrence is a big, handsome church with a bold south transept. There's a pretty little triple lancet window at the east end with emphasises the bulk of the chancel. It has an echo at the west end of the nave in the low tower arch, and there is a feeling of being inside a large barn of a building. Everything lay under a plain light, a cool simplicity that matched the silence and the birdsong. This is essentially still the church as restored by the Victorians, its tiled floors and polished wooden benches beneath the ancient walls forming a pleasing, quiet harmony. The only signs of colour were the fresh green riddel curtains behind the altar, and a little statue of the church's patron Saint set in a medieval image niche beside a northside window. A rather exotic sanctuary lamp hangs in front of the altar. Mortlock says that it is Turkish, and that it is said to have belonged to Florence Nightingale, although it isn't clear who is doing the saying. I suppose that there is every chance that it was brought back from some sacked church during the Crimean War, probably that of a Greek community in Turkey or southern Russia, although it is unlikely that it has been in this church all that time. The 1850s would have been too early for sanctuary lamps to be acceptable in most Anglican churches. Turning west, the medieval font stands beside the tower arch, and the space beneath the tower has been cleared of clutter, a perfect little setting for vases of dried flowers. 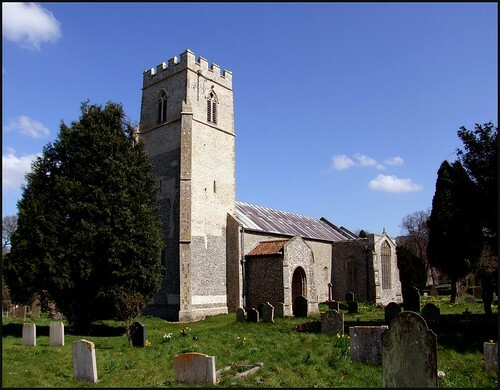 In historical and artistic terms, the parish of Hunworth has perhaps one of the less significant medieval churches in Norfolk. But what it does have is a quiet, ancient space, prayerful and numinous, open and welcoming; a place to stop and step out of time into eternity, if only for a moment.